For the last three decades our official analysis of Australia’s strategic environment has emphasised its fluidity. That trend is rising sharply. Indeed, today we face more uncertainty in our strategic environment than at any time since the Second World War. The election of Donald Trump has just added another significant element. I wish to focus on some of these larger uncertainties. The key point is that we are heading into uncharted waters and should be prepared for a wide range of outcomes. This puts a premium on being clear-eyed about our national interests, getting the first principles right and building the capacity to be able to respond nimbly to whatever comes our way. Let me begin with the US because it remains the single most important shaper of our strategic environment. There are many views of where the US is likely to be positioned in the global power gradient over the next 10 or 15 years. Some see the US as locked into a spiral of inevitable decline. Others recognise that US power is well anchored but argue that the margin of its primacy is likely to narrow considerably, as China gains more economic and strategic weight and other countries such as India exert greater influence in a more multipolar world. Still others contend that while the margin of primacy will indeed narrow, the US will still remain the strongest strategic power globally, not only because of its massive investment in military firepower, but also because it will remain the global leader in the industries of the future. Prior to Mr Trump’s election all these scenarios took it as a given that, whatever trajectory the US was to take, there would be continuity in the core elements of US foreign policy, including support for the liberal international order which is largely a US creation, advocacy of trade liberalisation and a commitment to the unique network of alliances that the US had constructed globally. Can we still assume these foundational elements of US policy, all of which are squarely in Australia’s interests, will continue under a Trump presidency? The truth is no one knows. Mr Trump appears to be a bundle of strong instincts but what we do not yet know is if he is also a man of strong policy views which, taken together, form a coherent view of America’s place in the world. And if he is such a man, how open will he be in office to changing his view? There is a lot which hangs off the answers to these two questions. Many have rushed to give us the answers in the short period since Mr Trump’s election but the reality is we will simply have to wait to find out. We can easily scare ourselves in the meantime but that does not achieve much. What a Trump presidency will mean for US strategic policy is likely to be revealed step by step and will have to be dealt with accordingly. So item number one in a basket of uncertainties facing Australia’s strategic outlook is the approach President Trump will take in office. There is a lesson here for strategic planners: there is no protection against black swan events. Who would have foreseen, when we were putting together the most recent defence white paper, that we would be asking ourselves ‘Has the US elected as president someone who may dislodge the foundation stones of US strategic policy?’. Uncertainty number two is the political and strategic settling point of China. China is a country and a civilisation which understands power and its sense of place has been shaped by the many centuries in which it was the Middle Kingdom. That pull of history is likely to play an important role in the way in which China relates to regional states. China’s leaders are acutely conscious of the many challenges they face. They are currently at the start of a profound transition in their economic model towards more market-based and consumption-driven growth with less emphasis on exports and fixed investment. The challenges posed by this transition are huge and we underestimate them at our peril. It is a high-wire act which seeks both to preserve the monopoly of power of the Chinese communist party while simultaneously allowing the market to determine the allocation of resources. There is no certainty about how this will end. We all, however, have a stake in the success of that transition. Abrupt shifts in China’s strategic policies, especially flowing from an economic crisis, would be highly destabilising. No one gains if China fails. I had always thought that the tensions between an economy which was opening up and a polity which was tightly controlled could be managed in the Chinese context for a very long time. That may well remain the case, but it seems to me that it is becoming harder to achieve. Much has been said of the challenges Australia will face as it manages its relationship with China and the US respectively. I do not subscribe to the view that Australia will have to make a binary choice between the US and China. But as strategic competition between the US and China sharpens, and if China continues to be dismissive of its international legal obligations in the South China Sea, it will inevitably become harder for Australia simultaneously to pursue our economic interests with China and our strategic interests with the US in a rules-based international system. Australia has next to no capacity to influence the direction of Chinese politics. We must continue to pursue policies designed to avoid invidious choices. But we also need to have a clear-eyed understanding of our core interests, both economic and strategic. We want to see China succeed in its economic reforms and to play a constructive role in the region and the world. But we also want to see a strategic system in the Indo-Pacific which is anchored in the rule of law and which recognises the stability which US strategic engagement brings to the region. We will not know for some time whether these objectives can be achieved and it would be foolhardy to conclude now that they cannot. In the meantime we need to continue to build a close and comprehensive partnership with China which will not quickly lose its position as our largest trading partner. Uncertainty number three is the political economy risk which confronts the broader Asia growth story: a risk exacerbated by the tepid outlook for global economic growth. This risk is not dissimilar to what is happening in China, although the political systems in the rest of Asia are very different. The last several decades have been decades of growth in Asia. But today virtually all the major Asian economies face deep structural economic challenges. And in almost all cases their political systems are struggling to embark on the reforms needed to address these challenges. It is here, at the intersection of economics and politics, that the biggest risks to the Asian growth story lie. And while Asia will undoubtedly continue to play a big role in Australia’s economic future, the rising political economy risk in the region suggests that we should also be alert to the need better to spread our economic risk. The interplay of politics and economics matters because our region is characterised by a tension between economic interdependence and strategic competition. Economic space is infinitely flexible. Strategic space tends to be much less so. The challenge of statecraft and leadership is to ensure that one does not derail the other. 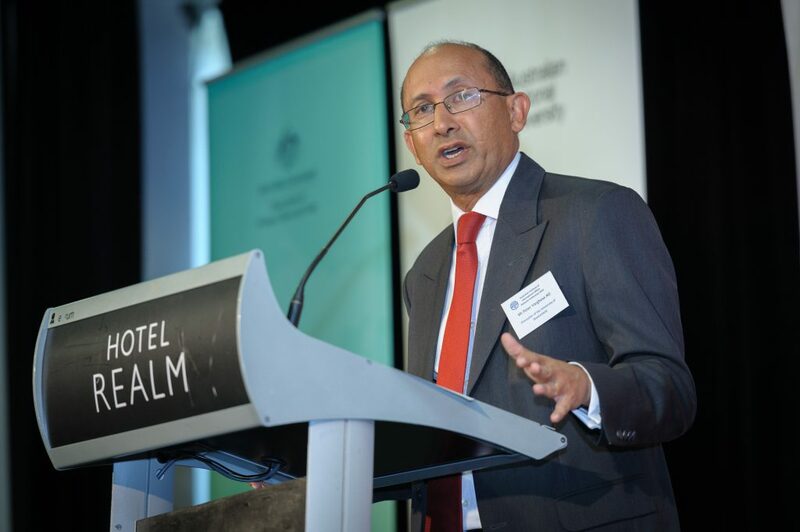 Peter Varghese AO is the chancellor of the University of Queensland and the former secretary of the Department of Foreign Affairs and Trade. This is an extract of his address to the AIIA’s 2016 National Conference, originally published by the AIIA’s Australian Outlook site. The full transcript of his speech is available here. Image courtesy of the AIIA.